When people think of tactical strategy, XCOM is usually one of the first titles that comes to mind. While that series has long held the title, Mutant Year Zero: Road to Eden is here to offer strategy fans another option for their brutal tactical fix. Set in a post-apocalyptic world known as the Zone, this game combines a unique setting with memorable characters and some twists on the familiar formula. Should you drop everything and travel down this path with the anthropomorphic pig, duck, and fox trio? Let’s find out. Mutant Year Zero: Road to Eden pulls from a rich lore. This game is both based and inspired by a tabletop RPG entitled Mutant from the 1980s. Specifically, the game pulls from the more recent prequel RPG called Mutant Year Zero. With a strong foundation for the story, Road to Eden gives players a comfortable introduction to the world, leaving much of the details a mystery in the beginning. The post-apocalyptic world is set 200 years after the fall of civilization in a region known as the Zone. Humans live alongside anthropomorphic animals that can speak and have personalities like anyone else. While the immediate storyline has to do with a missing member of your settlement, The Ark, the broad story concerns itself with the titular Eden. This place is reserved for fairy tales in the game’s world, but some people believe it actually exists. It’s a compelling mystery, and the in-game lore helps flesh out the world if you’re so inclined. Whether its optional dialog when you discover certain areas or items, or documents you find that offer their own stories, Road to Eden does a nice job of giving players extra story if they desire it. From a gameplay perspective, those looking for a challenge will certainly find it here. The game offers several difficulties, ranging from normal to a permadeath mode. Your squad begins with only two members, but you’ll eventually have the option to add a third. Gameplay switches between exploration, stealth, and turn-based battles. What makes Road to Eden unique is the way these all seamlessly fit together during gameplay. You’ll explore various areas beyond The Ark, looking for scrap and weapon parts. This is done from an isometric perspective, but the camera is zoomed in enough to offer plenty of detail. With a single button press, you can enter a stealth mode where you and your squadmates crouch and the colors change to a grayscale to indicate the mode. This is incredibly useful when enemies are nearby. Their field of view is indicated by red rings, which allows you to navigate into position before launching an attack. Much like XCOM, cover comes in both partial and full forms, indicated by a half-full or completely full shield icon. You can command squadmates to stay and hide in cover if you want to split up your group and launch a coordinated attack, which is crucial in many of the battles. When you initiate an ambush or you’re spotted, the game immediately switches to the turn-based mode. During your turn you can attack, move to cover, reload your weapon, or utilize secondary weapons. You also gain access to special skills called “Mutations” that can easily turn the tide of battle. Recharging them requires getting a certain number of kills with that character, so it’s important to use them sparingly. My favorite example is one that allows you sprout tattered wings and fly into the air for a better shot. You also gain access to upgrades such as improved health or stamina, which you can also spend your skill points on when you level up. Weapon modifications and other purchased upgrades from shops at The Ark allow for even more customization and boosts to your preferred play style. It’s a small detail, but I also really liked how the accuracy mechanic used simple 25% increments. This made it a lot easier than other titles in this genre to decide if a shot was worth taking. The mechanics mesh together extremely well, and the 15 hours of playtime is a nice length, especially given the lower price point. If there’s one thing that may turn some people off, it’s the difficulty. Even on normal, I had plenty of deaths on the Road to Eden. 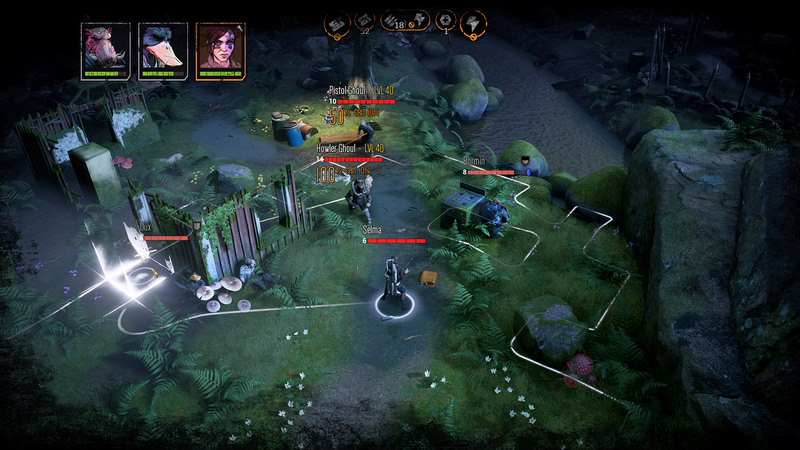 You can revive fallen members within five turns if you have a medkit, but Mutant Year Zero punishes you severly for lapses in your strategic judgement. Enemies are smart and take advantage of any and all holes in your defense. For those who like a stiff challenge, you’ll certainly find it here, but casual players may find even the normal difficulty to be too much. Mutant Year Zero: Road to Eden has a strong style that it wears with confidence. The anthropomorphic animal designs have a gritty edge to them, and the voice acting does a nice job of bringing them to life. There’s a cartoonish charm to them, like Disney characters that have seen things. Combine this with equally gritty and detailed environments, and you have a polished look and feel that helps the world come to life. While the enemies themselves could have used a little more variety to help them stand out, the overall visual package looks great. Fans of XCOM and other strategy games like it will find a lot to love in Mutant Year Zero: Road to Eden. For those interested in the genre, this is a unique take that offers plenty of its own contributions, but be forewarned, victory doesn’t come easy in the Zone.